9-03-16 - Byodoin (PDF)- Back in January, Andrew sent photos and a report on this temple In Japan. 6-06-16 - Andrew's back in Japan at Fukuoji where Mike Jamvold lived. Here's a page for Fukuoji on his Iron Fulte Song site. 5-19-16 - Andrew Atkeison's Iron Flute Song website. 2-11-16 - Andrew's report on attending Shunko Mike Jamvold's funeral in Kyoto. From the back of that book are the photo to the left and text below. 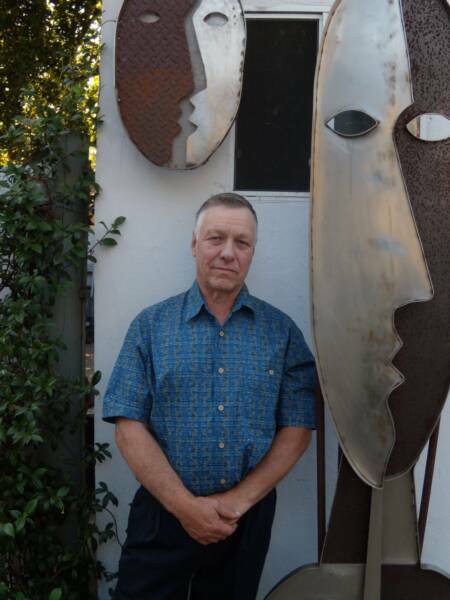 Here's a link to a book he did on blacksmithing. 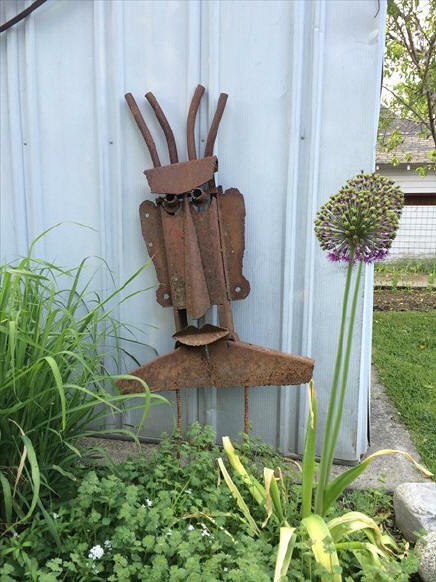 5-29-14 - Kelly Chadwick's photo of Andrew Atkeison's iron face sculpture that we had in John Tarrant's field marking boxer Lola's grave. When Kelly trimmed some trees there last fall, I asked him to take it home to Spokane with him. Thanks Andrew. 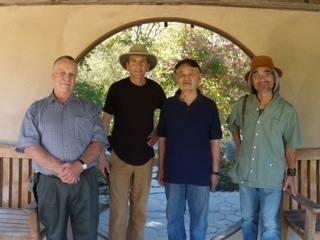 9-21-14 - L to R - Andrew Atkeison, Michael Stusser, Tozen Akiyama, and Zoshi Takayuki in the Meditation Garden at Stusser's Osmosis Day Spa Sanctuary.